Earlier last month when the world began dipping into the fever of FIFA, Indian football captain Sunil Chhetri’s video on Twitter urging Indian’s to show up for the match at the Mumbai stadium saw a humongous response. His video, while seeking to revive the spirit of the game among football fans across the country, brought to light the fact that despite calling football a priority sport there is nothing much that’s being done on that front. 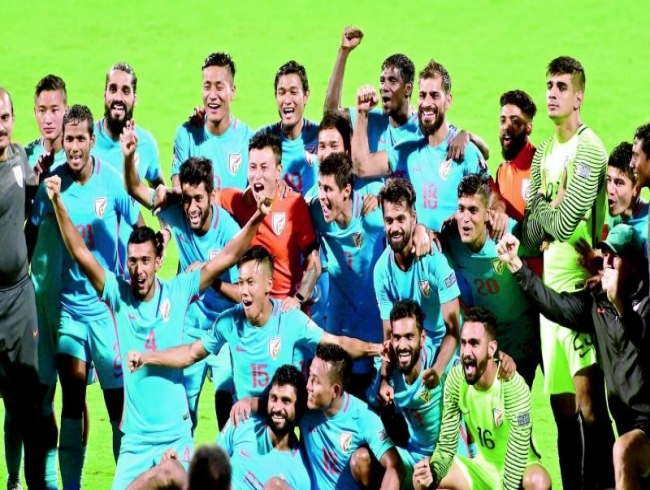 And so recently, even after appeals from Stephen Constantine and press conferences from All India Football Federation (AIFF) to go to Indonesia for the Asian Games, the Indian football team missed out when the final list arrived on Monday. Indian Olympic Association (IOA) has its point to make that the teams ranked in the top eight continentally will compete in the quadrennial event. However, looking at the popularity of the sport in the country, is it the right decision to hamper the growth? The Indian men’s team is currently ranked at 14 in Asia and overall 97. The jump has been rather dramatic from 171. What would rankle the fans of the sport is the IOA added eight new sports in the likes of Karate, Kurash, Pencak Silat, Roller Skating, Sambo, Sepaktakraw, Triathlon and Soft Tennis. Not that the athletes in these fields are not worthy but football could have been the ninth on the list. The criterion in the games is to have players below the age of 23 with three overaged players in the squad. The popularity of the sport in India can be measured just from the fact that more Indians travelled to Russia to watch the world cup where India is not even playing. It’s a country where kids use tennis ball if it’s bigger counterpart is not available. The eight new sports have niche outreach and some are even unknown to many. AIFF technical committee member Henry Menezes demands the government to be more encouraging. “Government should be progressive. They launched Khelo India, talked so big about football now is suddenly taking the reverse gear. They should promote and not get regressive. India has a young population and football is a mass sport followed by youngsters. It is an entertainment and crores of Indian are following the ongoing World Cup,” says the former Indian goalkeeper. Former Indian footballer Steven Dias who has also featured in the Asian Games insists that this will only hamper the growth. “It is really sad,” is his first reaction. “We were ranked at 20 once. We are only getting better. If we don’t play we won’t come to know where our strengths lie,” he says. Dias also argues that this will not be the best decision for the aspiring players mentally. He has over 50 caps for the Indian team and for someone with that sort of know-how; Dias knows what the youngsters need. “I have played at the Asian Games and I know how important it is for young players to play against strong teams like these. If you keep playing lower teams, you will not grow as a player,” he says. While the FIFA World Cup is advancing to its business end, who imagined that a Russian team ranked at 70 would eliminate the 2010 champions Spain? In a sport like football where the spirit is greater than skill, standings do not play a part necessarily. On the other hand, Menezes also demands IOA to use better standard to pick the squads. “The criterion of top ranking isn’t progressive. There should be a sensible reason. If Russia and Japan would have thought in those terms then they would not have fielded their teams to the World Cup,” says Menezes. “Look how they performed. There are few sports unheard of. We aren’t against any sport, as every sport should be encouraged. Mass participation is good. If IOA didn’t have sufficient funds, AIFF was willing to volunteer to spend money on Indian men’s and women’s football team,” he adds. The IOA’s decision has also left the fans furious. Waseem Ahmed who is the founder of the ‘Blue Pilgrims’ ran a campaign on Twitter using ‘#InquilabEIndianFootball’ only to get crestfallen. “If the government says football is a priority, is this how it will grow?” he questions. “There is a great vibe for Indian football currently. This was the right time to capitalize on it. Everyone is watching international football because of the World Cup and I’m sure they would support the team in the Asiad as well,” he says.